Where I live, dawn is very EARLY at the moment. I am a light sleeper and I wake as soon as it is a little bit light - 3.30 or 4.00 am. Once I'm awake, I can't stay in bed for long, so I see plenty of dawns. In summer I'm very often well into my day before the sun rises just before 5 am. It's the time of day I love - fresh and new, the darkness has gone and with the dawn comes light and all the potential of a new day. Even if you don't have any interest in Christianity or the Bible, this quilt is still relevant. The nine little mini-quilts have just one or two words - all of which have impact on our daily life and our relationships with others. Putting these concepts into practice will have us with lives 'shining like the dawn', in contrast to the darkness and evil that is so prevalent in our world. I hope you will join in each month. 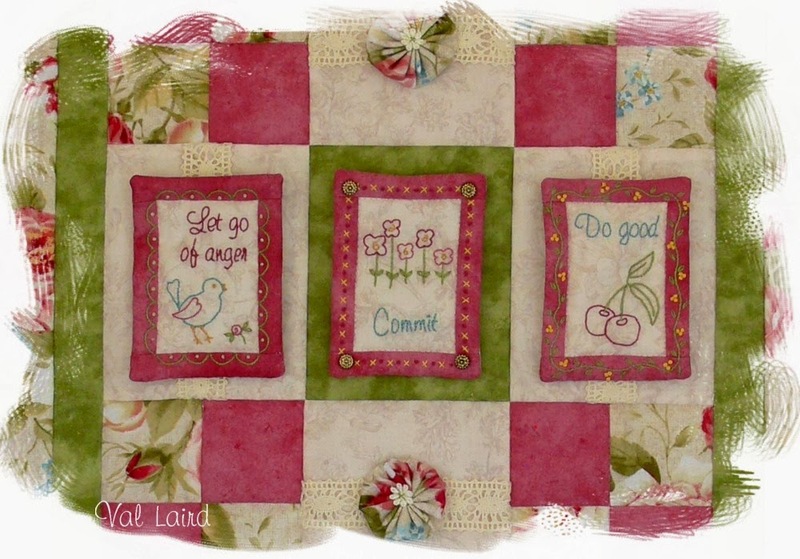 The mini-quilts are very quick to make so this Block of the Month is really achievable. Each month from January to September you will receive the pattern for the mini-quilts then in October and November I will give you the instructions for putting it all together. The design is completely free, but I would love it if you would put my Shining like the Dawn button in the sidebar of your blog with a link back to http://val-laird.blogspot.com. (Just right click the image below and "Save Image As" a jpg file onto your computer, then upload it to your blog.) Or you can advertise it on Facebook, or any other way you can think of. The pattern is for personal use or to make as a gift but please do not use it for profit. 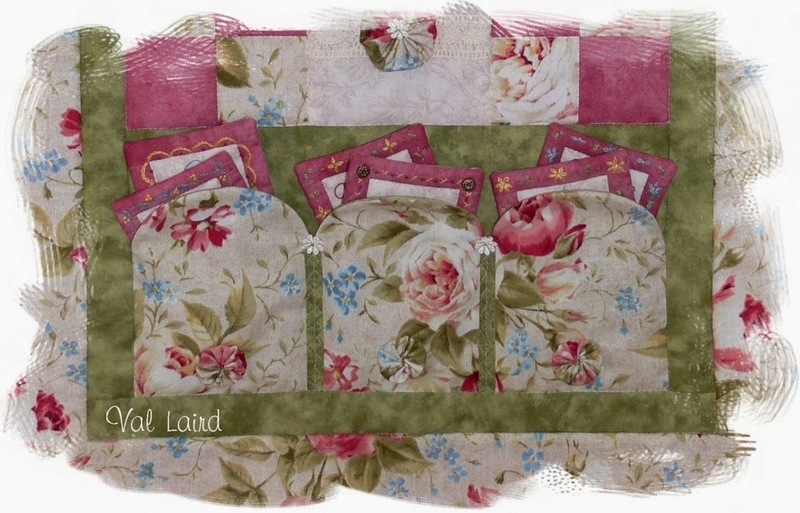 When you feel like a change of thoughts to display, it is easy to swap them around and the six mini-quilts that you are not using will fit neatly back into the three pockets. The quilt measures 49.5 x 67 cm (19½ x 26½ inches) and the mini-quilts 7.5 x 10 cm (3 x 4 inches). 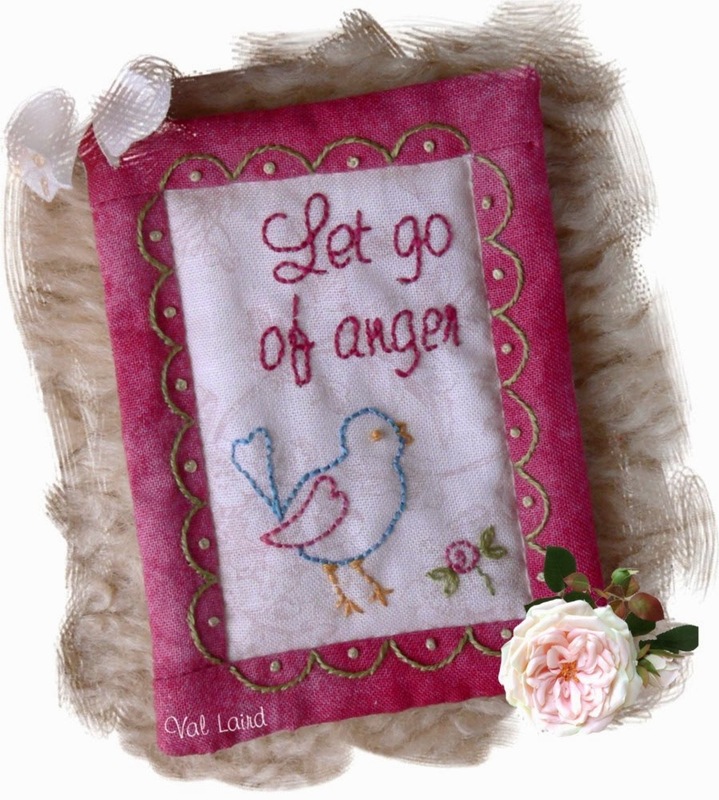 This month I am giving you the materials list, cutting details and the first of the mini-quilts which is about anger. Let go of anger and leave rage behind. Do not be preoccupied. It only leads to evil. Allowing anger to gnaw away within us never does any good. It always harms us and those around us. The message of this stitchery is a good place to start, don’t you think, in our quest for lives that shine like the dawn. You can download the first pattern here. Each new pattern will be available for download until the end of December, so they will be there if you happen to miss one. Apart from doing all the preparations for the launch of the BOM, I've spent time preserving a case of plums, taken my sewing machine back to the technician because the recent service didn't fix the tension problem, unpicked some embroidery three times and started two new designs. You might like to catch up with me on Facebook to see photos of what else I've been working on. How sweet of you to offer this beautiful project for free! You have such a keen sense of imagination and design such incredible projects. This one really raises the bar! A wonderful project, thank you so much, Val! 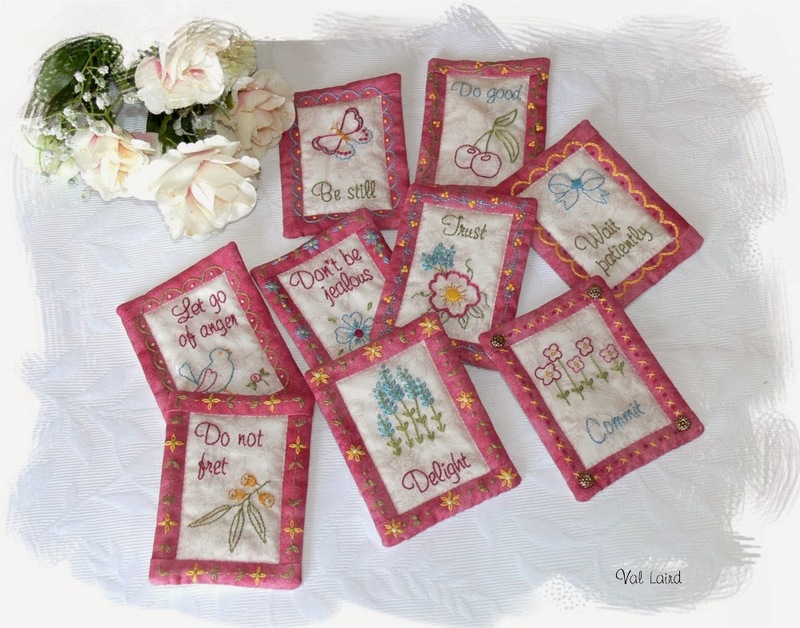 It's great to find blogs that inspire me to be a better person, not just a better stitcher or quilter. Thanks for sharing,love this and will be doing it. Thank you, I love the use of the bible and the pockets. You make the prettiest designs, Val, and once again, you've outdone yourself. Such a lovely piece, with beautiful sentiments. And that you give this away... well, it's just a testament to the person you are - generous, thoughtful, and inspiring. Val thank you so much for the beautiful new BOM. It is very pretty. And I like how it has the different sentiments that can be changed out. Thank you for sharing your wonderful talents with us. Really gorgeous patterns, Val! And you're so generous to share them with us freely. Thanks so much. Thank you for sharing this beautiful design with us. And the fact that it comes from the Bible makes it all the better. How pretty! Thank you for sharing this BOM project! Your button is on my blog, too. How beautiful Val! I feel the same way about the dawn. I love that time of day. Love it, can't wait to get started. Thank you for another lovely freebie. Dianna, you have come up as "Unknown" and you are also a "no reply blogger" so there is no way I can contact you. Please email me so that I have your address. Hi Val , encouraged to find your blog while I was searching for some very good BOM S I was ecstatic to see subject matter of bible themes on them, I hope this message gets to you Im new at this messagng on blogs thingy.!! Hi Val , love your website new to blogging here , looking for inspiration. 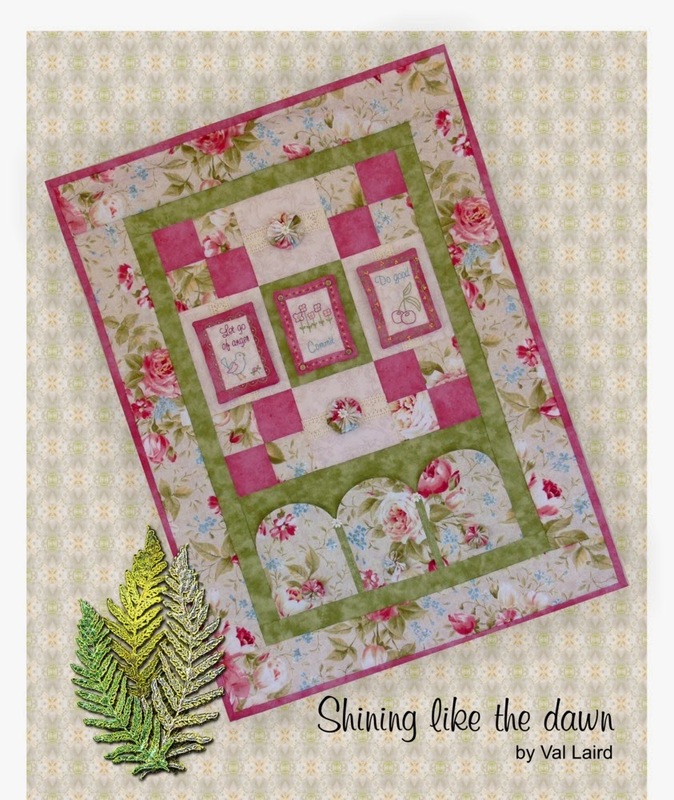 I just discovered your blog and this wonderful quilt pattern. I realize it was done last year and am wondering if you have it available as a pattern for purchase.